Canadian National Railway Co. (CNR.TO) and Canadian Pacific Railway Ltd. (CP.TO) imposed embargoes in the Vancouver area in November and December that hurt pulp and paper mills, sawmills and exporters of legumes such as dry beans and lentils, according to industry groups. Derek Nighbor, head of the Forest Products Association of Canada, warned the railways against playing "commodity whack-a-mole." "There were only a few commodities that seemed to be caught in the crosshairs," he said Monday. "We need to figure out exactly why these embargoes and stoppages are happening." In an email, CN acknowledged the recent congestion on the West Coast. It pointed to harsh weather and the intricate supply network that feeds into Canada's busiest port. 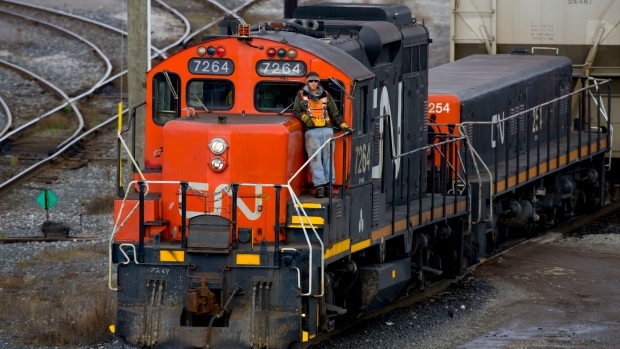 "CN acted swiftly and efficiently to serve its customers during this period and played its role in moving record volumes through Vancouver's complex and multi-commodity supply chain," spokesman Jonathan Abecassis said in an email. CP cited record grain shipments and a busier port in recent months as global trade tensions work in Canada's favour, with a Chinese tariff on U.S. soybeans and retaliatory European tariffs on U.S. corn spurring more Canadian exports. "It is irresponsible to institute an investigation without at minimum reaching out to ask CP for information," CP chief executive Keith Creel said in a statement last week, complaining that the CTA did not reach to the railway ahead of the probe. "Are we perfect 100 per cent of the time? No," he continued. "The flip side of that coin is: when we are subject to unsubstantiated action, I will be the first to step up and defend the men and women who make this operation run." Nonetheless, "long-standing and fairly widespread problems" affecting some bulk goods may necessitate longer-term solutions than the investigation can set in progress, including larger freight cars and more unloading facilities. Pulse Canada spokesperson Greg Northey, whose association represents 35,000 legumes growers, processors and exporters, stressed the uncertainty and disruption triggered by abrupt rail stoppages. "The shipper starts to scramble, they have to find another transloader," which dumps rail car commodities into containers ahead of port loading he said. "They miss the container boat they were scheduled for...It becomes a real logistical nightmare." Northey added that rail traffic rationing by CP "seems to indicate there aren't enough resources in place to meet their obligations." He qualified that "it's not black and white," acknowledging high traffic over the past year. In the Vancouver area, CN moved record volumes of freight in November, December and, to date, January. The Montreal-based company invested in rail cars, track doubling and expanded rail yards -- particularly between Chicago and the West Coast -- to the tune of $3.5 billion over the past year, 30 per cent more than its three-year average. It has plans to keep building in 2019. Calgary-based CP, meanwhile, aims to have 1,000 more grain cars in service by this spring, following CN's order for 1,000 hoppers last May. "The railroads are making very comfortable profits. Are they reinvesting that to build out their capacity, or are they just trying to enhance returns to their shareholders?" asked Gunter Jochum, a director with the Western Canadian Wheat Growers Association. "Grain movement has been pretty good this year. Very few problems," he added, despite the major backlog in grain shipments last winter.